This new year has been one constant surprise after another. Its only February...seriously...based on this ratio--bring on the surprises! I welcome them with open arms and a grateful heart. Our doula community is amazing. We are working on some AMAZING things for birth, for the community and for anyone who wants to learn about normal birth and improving US birth outcomes. Moving to Arizona was probably one of the best decisions I have made. Over the last month I have met amazing men and women who are committed to assisting mothers and families have their best birth. We are so excited to be announcing some consistent, evidence based, education oriented events and projects that are just going to be rocking. Look forward to that news and events, as well as new packages, offerings and many more things that are in the works. So grateful to be a part of this birth world. Looking forward to continuing this wild adventure! A couple of days ago, a VERY dear friend of mine and I were chatting. We have known each other for a very long time. We met in high school and participated in many sports together. She is one of my dearest friends. We were catching up. We both have busy lives, live in different states, but its as if we never spend any time apart when we chat with each other. She asked how life in AZ was treating me and I was sharing with her my experiences as a doula, what I had learned, how so many things have changed. My energy shifted, there was passion, joy, enthusiasm. She made a comment: "Wow, Nancy, It seams you really love what you are doing?" That comment stuck in the back of my mind...I really do! Its amazing what happens when you find things that just align with who you are, that open you open to help you become someone you never thought or could imagine myself being. Its being a crazy trip. As I was sharing with her all that I was learning, she said "Well, since we are on the subject...I am pregnant!" I couldn't have been more excited for her. I contained my joy and asked her how she was feeling, thinking, what her husband was thinking. I was just so elated for her. Discuss with your husband/partner/significant other. If you don't know, start with this questionaire. As I mentioned before, birth is something that is not dicussed in our current culture. Our only knowledge of birth usually comes from what we see on TV or in movies (unless you were surrounded by a different viewpoint growing up). Water Breaks, Mom gets upset at father, screams bloody murder, is lying with her legs up and BAM! clean, baby is given to mom...so easy!! Nothing to practice here! The reality is, birth is a process. Do you remember your birth? Have you asked your mom what your birth was like? What are some thoughts that come to your mind when you think of this experience you are about to have? Do you want a medicated or un-medicated labor/birth? Do you want a Natural Birth? What happens during a 'natural birth'?What feelings come over your body? How does labor progress? What kind of environment are you in? Are there lots of lights, unknown people, door opening and closing? Or are you in a quite space, dim lights, no interruptions, just you and your support team? How do you WANT your birth to unfold? By allowing yourself the space to vision, you open up your mind to new ideas and things you might never have thought of. I have done this exercise a couple of times and each time I am left with the thought of "geez, I really need to learn more about _______" to investigate if I really want that in my space during birth. For some reason, the horror stories come out when people begin to learn you are pregnant. "My DR wouldn't let me do that" "I had to have a Cesarean because my body didn't work" "Homebirth is dangerous" "What if something happens" "I was in labor for 80 hours!" Thank the people for sharing, but KNOW that EVERY birth is different. Appreciate their experience, it does not have to become YOUR experience. Choosing where to give birth is a personal decision and varies (unfortunately) by what your state (or insurance) will allow. The most familiar option is Hospital. Are you familiar with Birth Centers? Are you familiar with the option of Homebirth? Know the benefits and challenges of each option and birth where you FEEL safest. Why is it important? For some women, that is the hospital. Others, they want to be in their home. Others choose the comfort of a Birth Center. Here is a great article on the different options and the benefits of each. After you determine where you are going to give birth, its important to assemble your support team. Ob/Gyn? Midwife? (do you know the difference between a CNM and a LM/CPM?) If you have chosen a hospital, PLEASE get the additional support of a doula. There are numerous research studies that show the support of a Doula during childbirth benefits the mother and baby. Unfortunately, with our current hospital medical model, the majority of the time Nurses have multiple clients, so they are unable to be with you for the duration of your labor. DRs normally come in when you are about to give birth, so its important to have someone who is educated in birth and understands ways to help you alleviate any discomfort, support you in your desires and be your loudest advocate in the face of uncertainty. Policies and procedures have overtaken patient centered care in the majority of hospitals. What is Patient Centered Care? Moms often feel left out of their own birth experience because they end up feeling more like a number than a human being. Are your needs being met? Do you know what kinds of questions to ask your care providers? If you aren't being heard and your questions being answered, maybe its time to think about changing care providers. Know you always have a choice. When I was pregnant, I didn't even think about attending a childbirth education class...I just thought I would do enough research on my own, ask a couple of friends and viola! I would be prepared. After going through my Doula training, supporting women (and their partners/husbands/significant others) during the birth process...its imperative you attend an INDEPENDANT Childbirth Education course. Why Independent? Since 98% of births happen in the hospital in the US...the majority of the time Hospital Birth Classes are about teaching you to be good patients, not empowering you to honor your birth experience. Some great suggestions are: Bradley Method, Hypnobabies, Hypnobirthing, Birthworks, CAPPA and many more independent ones. Check your area because your local birth professional network (of doulas/midwives/lactation consultants) might offer their own version of classes. Think about this: we spend thousands of dollars on dresses, flowers, food, music, tuxedos, destinations for weddings...do you think its important to invest some time into helping your baby come into this world a better way? Birth is not just a physical act, its emotional, physical and spiritual. Doubt and Fear are usually the most common concerns that are discussed with women who are pregnant. Did you know that FEAR actually inhibits the birth process? We instinctively revert back to our 'fight or flight' system. Learn to address the fears and concerns you have. Investigate them! Prepare your body for labor, during your pregnancy. You dont need to go run a marathon, yet know that birth is an intense and physical act, your body needs help preparing just as much as your mind does. Eat foods that are nutritionaly sound, attend a prenatal yoga class (will help you establish your own breath), make sure you are moving throughout your day. What procedures do you think are mandatory during pregnancy, labor and birth? Do you know the benefits and complications that can arise from normal birth interventions? They might be common 'procedures' but how do they affect the laboring mother? The baby? Do they hinder babies development or make it harder to establish a physical bond? Do you know what procedures you want done once baby arrives? What about the placenta? You are not pregnant forever (although some days it might seem like it). You have created a miracle! You are growing a human inside your body, that needs to be celebrated! What you are doing is unique and something not everyone gets to experience. Focus on the moments that make you smile. Feed your soul the joys of your experience. Birthing a baby is not only about having a child, its about becoming a mom and creating a family unit. How you remember your experience will be with you for the rest of your life. Empower yourself. Stand firm in your choices. Ensure you are being supported: emotionally, physicaly, spiritually in your experience. Plan, prepare and let go, enjoy the ride. "The mystery of life and birth is a profound invitation to be authentic as you trust and tremble your way through labor's Gates of doubt and fear. It is possible that you will become more intuitive during labor than at any other time...Allow your body to guide you in your breathing, in your unique movement, in knowing...what to do...even when you don't know what to do." ~Pam England "The Labyrinth of Birth"
Have you noticed how people always seem to have an opinion on everything related to pregnancy, birth, labor and parenting? The list can go on and on....one of the biggest challenges women who are pregnant face is negativity towards their birth choices. We need to provide an environment of non-judgement. Everyone is doing the best they can with the information they have and NONE of us should feel, or make other people feel bad for what choice they made. One of the roles of being a Doula is providing emotional support. Women have a keen intuition on what they feel is best for their body and baby....after all they are the ones that have been living in their body! Doulas many times speak about "holding the space" allowing the woman the ability to just BE with her choices....really look at them from every different angle...providing her with information if needed...but sometimes, just being there...is enough. That takes patience, kindness and unconditional love. WE all have our own ideas of what WE think is best...yet we need to allow the woman to make those choices and receive support for them, whether or not we align we her choice. The majority of the time, we only hear about 'bad' stories surrounding birth. Here are some great stories you might not have heard yet: When discussing options with friends that might be pregnant, ask them this questions: "How can I support you?" ...and just see what their response is. When a woman learns that she is pregnant, waves of different emotions course through her veins throughout her pregnancy. Choices have to be made, not only during pregnancy, labor and birth...but everyday. It can be exhausting to weed out the things we consciously choose not to embrace by being a new parent. The Case for Evidence Based Care is reaching a critical mass; The US has a higher maternity mortality rate than 40 other countries, yet we as a nation spend MORE than any other country on healthcare. Women want to be treated as they are human, not based on 'norms' and 'averages' and 'protocol' and definitely not heard when discussing options with their Primary Care Provider. EVERY woman is different just as EVERY pregnancy/birth/labor is different. I can see on one hand why protocol and policies are put in order...to ensure their is a formatted way of handling each situation that can arise...yet...by embracing that kind of care....do we loose sight of the essence of birth? Do we loose sight of the magic, the blessing, the mystical arrival of a new human being on this planet? Is there a way to build the bridge? Can we support the essence of birth while still providing the best possible care? Can we stand side by side women and help them make choices about their bodies, their pregnancy and their child without manipulation, harsh words/tones and attitudes that dis-empower them instead of lift them up? I think it begins with each of us, creating a small ripple of encouragement and joy for our family, friends and acquaintances. Only by making better choices, actively participating in our experience, can we learn through our choices and learn to make better ones. How Can You Meet a Doula? As part of becoming a Doula, we are taught that this is our business and we have to find ways to market ourselves. Anyone with their own business can understand how that process can sometimes be grueling and difficult. As someone who also has another business, of which I started about 7 years ago....it is difficult when you are essentially 'selling' yourself. No one is going to do the advertising for you. No one is going to brainstorm about where to put your information where people who are interested in your services will be able to find you. Its all up to me. I am ok with that. Because I know the value that I bring to my clients and future clients. Its important for me to get my name out there so individuals will be able to find my services! I have noticed through various Doula Meetings around the Valley, that there are a lot of new Doulas looking for women to serve. We go over how to 'market' ourselves briefly in our training, yet its basically Trial and Error. Plant some seeds, see what grows...keep doing the things that work. Upon meeting some other Doulas in the area; we decided to create a "Meet the Doula" event. Our thought process behind it was that there are parents to be WANTING our services, they just don't really know where to look. Its especially the case if they recently moved here, don't have friends in the area that have recently hired a Doula for their own birth. Considering there are over 50,000 births every year in Maricopa county...I am sure some of those mothers would appreciate additional support! We wanted to be efficient with the Doulas time, and the parents to be. Thus creating our Monthly "Meet the Doula" Event. Where moms and dads can come and learn about Doula care, birth and postpartum, meet Doulas that serve the Valley area and if anything; walk away from the event with a bit more information for them to be provided with Evidence Based Care. We wanted it to be consistent as well, so people didn't have to remember a different time or place every month. If you are in the area and are looking for additional support, or know someone who is looking for support, yet don't know where to find that support: feel free to attend our monthly meeting. Its free, informative and lots of fun! As I transition into this profession, I have done a lot of research in regards to what to charge for my services. Asking Doulas in the community what they charge as well as looking at other Doulas in different parts of the country and world. Having a background in Economics; its important to understand the "Cost-Benefit Analysis" for our services. No one is becoming a Millionaire by doing our work, yet we feel it is important to be paid our worth because there is a lot that goes into the price of a Doula. Our fee is the same regardless of the length of your labor. Because of the nature of birth, an hourly fee would be out of reach for most families. Most doulas in this area charge anywhere from $350 to $950. The fee charged usually reflects the economy of the area as well as the doula's experience and certification status. If you feel you are unable to afford the fee, discuss this with your Doula before saying no and trying to find a 'cheaper' Doula. Its important to create an open discussion around fees and services, because by discussing the services a Doula provides, you just might decide that her services are more important than the fee she is charging. A doula is a full-time resource, providing emotional support and strength even when not physically present. It's time spent gathering, compiling, and presenting information to help you make choices and understand the implications of those choices. We spend an average of 25 hours with each family, in pre-natal appointments, birth, post-partum. This is in addition to being on call full-time (24/7) for an entire month surrounding your Estimated Due Date. In addition, we are researching, networking, and continuing our education and credentials to provide you with the best service possible. The long hours we may spend with one couple translate into increased experience and knowledge that carries over into the next, possibly shorter, birth. Couples having a first baby may imagine that their doula will only be spending a few hours with them during the labor and birth. In reality, an eight-hour labor would be considered pretty fast; most first labors last at least 24 hours. Clients per Week - When I make a commitment to be your Doula, I have to limit the number of clients I put on my calendar so as to avoid birth conflicts and to ensure that I am reasonably rested when you go into labor. The rule of thumb for birth professionals providing in-home services (compared to someone working a shift in a hospital or sharing call with another provider) is that one client per week is a full schedule. Two to Three clients a month is a full time schedule for Doulas in this area. Clients per Year - When I put your due date on my calendar, I commit to being available two weeks beforehand and two weeks after that date. This means that when I schedule a vacation, or attend a conference, or have a commitment that I cannot miss, I have to add another four weeks during which I cannot accept clients. Occasionally, my clients hire me with my backup on-call during times that I may be unavailable. We may turn away potential clients for the period around your due date to avoid conflicts and be reasonably rested when you need us. We will not go out of town (unless in the case of a family emergency) and are available to you at all times. Our family may need to take 2 cars when we go out. We may have to have pre-arranged childcare for children, substitutes for classes we are scheduled to teach, and coverage for other responsibilities. If for any reason we are not able to be available for any period of our on-call commitment to you, we will inform you of this and contract a back-up doula at our own expense. The rule of thumb is that a self-employed professional's income is only half of what they earn, after deductions for vacation and sick time, self-employment taxes, insurance, and business expenses. As you may imagine, my communication expenses are high - business phone, cell phone and computer connection. I also have typical professional and office expenses, continuing education expenses, and unusually high transportation expenses since I primarily travel to people’s homes. As an example: lets say a Doula Charges $600 for her Birth Services, she is doing this full time and does not have another source of income. She takes on a full client load of 3 births/month. If she never takes ANY vacation she will have helped 36 clients/yr...With her fee, she is earning $21,600 BEFORE: taxes, internet, business expenses, car, phone, insurance, professional fees. Not to mention normal everyday items such as food, gas, home expenses. If we follow the rule of thumb above, a Doula's take home pay is $10,800/yr Would you be able to live off of $10,800/yr? You can see how Doula's want to be able to provide services for ALL individuals, yet also need to make a living to be self-sustaining and not burnout. When I step into a birth, I bring not only my heart and hands and training, but my experience as an athlete, nanny, speaker and continual research on subjects relating to birth. As a doula, I must keep up-to-date on the latest studies, procedures, protocols, and policies surrounding birth and area hospitals and providers. Did you know that doctors, midwives, and nurses usually only know their way of doing things? As a doula I see the variations from hospital to hospital, between care providers, and over time. Being able to work with many different care providers, I learn all their different approaches and tricks, which I think is unique to the doula profession. And considering that every birth and every family teaches me something new, I have a wealth of knowledge and skills to bring to birth. Nobody's getting rich doing doula work. Yet every doula needs to be able to make a decent living without making her life unbearable. I wish I could offer my services at a rate than everyone can afford, yet that would require I make even greater financial sacrifices and de-value what I believe I am worth as a Professional providing an extremely important service. Once I finish my certification, I will determine my rate for my services. It will allow me to do this work and not have to supplement my income from a normal 8-5 job, thus allowing me greater flexibility with my clients. If you need free doula services, there are many ways I can help you find a free doula; otherwise, we are doing future birthing women a disservice by making labor support an underpaid profession that cannot attract or keep talented, skilled individuals. If you end up selecting a doula who is undercharging for her services, I strongly encourage you to pay her more than she is asking; otherwise, she may not be around to help you with your next child. The most common cause of doula burnout is feeling overwhelmed by the commitment and uncompensated for one’s time and dedication. Doula services are rarely covered by medical insurance plans, even though the statistics prove that doulas can save insurance companies lots of money by reducing the use of medications, interventions, time in the hospital, and surgical (Cesarean) births. DONA, the organization that I am receiving my certification from, has been able to create a "Doula Code" with Insurance providers. You can ask your Doula if she has a Doula code, that allows you to receive some amount of what you paid to your Doula by filing a claim with your Insurance Provider. Lobby your State legislature to include doula services in state-funded healthcare so that low-income women have access to experienced doula support and doulas don’t have to further their financial burden by attending these births for free (that is what we do now). Additionally, you could talk with your midwife or doctor to encourage them to offer universal doula care to their clients. By hiring several doulas to be on-call for their clients, they could substantially reduce the cost per birth (and make their job easier) - although in this model the doula might be someone you've never met before. You could also advocate for the hospital to provide universal doula care, so that it would be covered in the same way as their in-house lactation consultants are covered. By all means, tell everyone you meet about the support you received from a doula – spread the word about doula care so that more doulas are needed and are well-paid and can continue their work for generations to come. When I was deciding on what to 'call myself,' I wanted it to encompass my passions and be simple enough for people to remember. There really isn't a good definition for "wellness" and I wanted to do my best to offer a definition that includes every area of our life. As a Certified Wellness Consultant over the last seven years, that has been part of my work...guiding and assisting individuals to live a healthy and more fulfilled life. I wanted to take what I have learned from that endeavor, and incorporate the two areas into my Doula practice. Thus creating "Wellness Doula" for my Doula Business. It might change over time, yet for right now; it feels right for me to offer my services with that foundation and expectation from Clients. As I mentioned above, there really isn't any 'set' definition for the word "wellness". I do not even recall is being a 'word' when I was growing up, so it is a recent addition in the advent of new industries such as Chiropractic Care, Aromatherapy, Massage, Nutrition and other Holistic ways of approaching our life. Interestingly enough, there is actually a website that offers a definition of wellness and I really did enjoy what they offered. You can view their whole definition here. As they mentioned, 'wellness' is a tough word to define b/c it can be a chameleon or sort, changing with the idea of who offers the definition. From my understanding, it is different from 'health' because I see it as offering a more holistic approach to well-being. Health in my mind tends to mean we are looking at a body and that person can be considered healthy. Wellness, to me, is multi-dimensional, yet offers a way to determine if someone is living the values and principles in every area of their life. Its all encompassing and can also change. *Aware means that we are continuously seeking more information about how we can improve. *Choices means that we consider a variety of options and select those in our best interest. *Success is determined by each individual to be their collection of life accomplishments. Earl Nightengale always said success is a "progressive realization of a worthy ideal." If 'Wellness' is all encompassing, then how can we define it so it applies to every area of our life and also allows for us to move forward to improvement and growth. 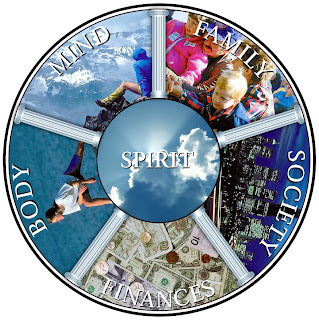 Looking at this wheel, there is Spirit on the inside and 5 areas of all of our lives around the outside. I look at that and see "Spirit" as "I Am". I am Spirit: (Holy Spirit, Universe, Energy, etc) whichever form you choose to name it, every philosophy has an understanding that there is something 'within' us seeking expression. How do we seek expression? We all have a Mind, where we question, contemplate, understand, problem-solve, allow and receive ideas that affect our beliefs. We all have a Body that allows us to function throughout the day...and most of them we don't even notice! When was the last time you thought about brushing your teeth? Or thought about how many times your blood pumps through your body each day? Our body allows us to go throughout our day...how overwhelmed would we be if we had to THINK about every function we do? I know I would be exhausted! We all have Family I take this a bit broader and define this as all of our relationships with others. Whether they are related or not, we are very much social human beings and thrive when surrouned by people who support us. It is an inter-dependent relationship, we all need others in our life in some degree. We all live in Society, its our community; we have families and groups we are a part of. We are all part of our Countries in which we live and our Global Society; all of us who live on Earth. The final 'Pillar' is Finances. In order to function in our current society, there needs to be an value of exchange. Our current value for exchange is called "Money." I think its fair to say that all of us would like to have 'more', yet we can also see if we don't have how it affects our daily life. We can see, by this definition, called the 5 Pillars of Health encompass every area of our life. It also allows us to move forward, offering a 'map' that guides us to improving each of these areas of our life. If you are interested in learning move about the 5 Pillars of Health, feel free to contact me! How Does This Apply to Being a Doula and Supporting Women in Birth? Birth is much more than just a physical experience, yes, it demands much from the Mother's body. There are so many changes that take place when a mother and/or couple find out they are pregnant. Questions about being a good parent, who will care for the child during the day, finances to afford the new addition, what will our expanded family think of our great news. It is a multi-faceted experience. My approach to Birth/Pregnancy and guiding and supporting the new mom and/or partner is very much from the foundation of understanding and creating a foundation of support with these areas as the guidepost. During our pre-natal meetings, we will discuss these 5 different areas, address fears/concerns and allow the mother and/or father to process and discuss. Every parent wants a healthy baby, yet I would think we also want an environment that this new child will grow up in to be healthy as well. Also, the mother and father are stepping from being Adults, to becoming Parents...this is a big step for a lot of people and can be overwhelming on what steps to take. It might be or take a bit longer and there might be a lot to process. Yet, Stephen Covey always says "Begin with the End in Mind." If we begin from this foundation of Wellness, then we have a guide in regards to daily actions and we have the potential to have less stress and be more aligned with the magic and adventure that life allows and brings to us everyday! "If there was a machine that cost $200,000.00, reduced the cesarean rate by half, cut the length of labor by 2 1/2 hrs and decreased other interventions, hospitals would have 2, 3, or 4 of the machines. It's hard for us to believe that human support can have such a profound effect on a medical outcome." --Dr Klaus talking on the "Today Show"